Happy Thanksgiving and early Merry Christmas! The Republicans subpoenaed disgraced, crooked former FBI Director James Comey. And it’s about time! And of course Comey asks for exactly what he doesn’t want: a hearing for everyone to see. Comey had highest-level cover (the FBI no less) and was deep into an effort to eliminate Trump. Trump had to move hard, fast, and at exactly the right time to cut the head off the snake without getting bitten by the snake or being finished by the other swamp denizens. Notice that the President fired Comey when Comey was 3,000 miles away from his office. Comey had no inkling he was being cut, and that all his files, computers, and everything in his office were seized by his boss Sessions and the justice department. This was not a violation of protocol, it was tactical. Notice how Prez Trump compartmentalized the strike and did not inform any of his White House “staff” to prevent leaks. Notice how he emasculated Comey and the swamp denizens by letting them know in a tweet that the Attorney General got information (surveillance “tapes” from the seizure of Comey’s office) to let Comey and his handlers know that Trump’s DOJ has the goods on them. This was a brilliant, strategic, and totally imperative move at exactly the right time against horrible, evil and corrupt powers infesting our government. Keep in mind, this was after Comey gave the entirety of the Clinton staffers immunity. But what Comey did beforehand showcases our contention of his “fixer” status. Comey was a minor assistant US attorney in the late ’90s. He only gained power and money by being the DOJ official who “investigated” and cleared Bill Clinton of any wrong-doing in Clinton’s totally corrupt pardon (for huge payoffs) of criminal financier Marc Rich as Clinton was leaving the presidency. This is how Comey began his career as a creature of the “swamp” years ago, as a servant of the Clintons. Comey provided “cover” for the Clintons in their gaining incredible power and wealth after leaving office through pardoning a billionaire money-launderer, arms dealer, and criminal. Comey was a key piece in how the Clintons upped their corruption game and gained incredible wealth through their foundation after leaving the White House. A huge part of the scheme was giving Marc Rich a free pass when he should have spent life in prison, and that is what Comey covered up for the Clintons. This set up Comey to be part of the corruption machine, making him powerful and wealthy. Immediately after doing the Clinton’s dirty work as a DOJ official, Comey resigned from the DOJ and took a position as the head attorney (Counsel) of the Lockheed Martin company, a huge military contractor. While he was in that position Lockheed became a major contributor (millions) to the Clinton Foundation and its fake charity spin-offs. In return for these payments to Clinton Inc., Lockheed received huge contracts with Hillary’s state department. Comey was the chief legal officer of Lockheed throughout this period of contributions to Clinton Inc. in return for State Dept. contracts. In 2013, the largest bank of England, HSBC Holdings, was deep into a scandal. Investigations by federal authorities and law enforcement had revealed that for years HSBC had been laundering billions of dollars for Mexican Drug Cartels, channeling money for Saudi banks who were financing terror, moving money for Iran in violation of the sanctions, and other major criminal activity. HSBC’s criminality was pervasive and deliberate by the bank and its officials. HSBC was a huge Clinton Foundation contributor (many millions) throughout the “investigation” and Bill Clinton was being paid large personal fees for speaking at HSBC events (while Hillary was Sec of State). Eric Holder and the Obama Justice Department did what they were paid to do, and let HSBC off of the hook for a paltry 1.2 billion dollar fine (paid by its stockholders). Not one director, officer or management member at HSBC was fired or charged with any criminal. Exactly when everyone involved with HSBC Bank (including the Clintons and all of their “donors”) were being let off without penalty, and cover had to be provided to HSBC, Comey was appointed as a director and member of the Board of HSBC (in the middle of the fallout from the scandal). Comey was part of the effort to cover up the scandal and make HSBC “respectable” again. After about a year as HSBC director, despite his lack of any law enforcement experience, no DOJ leadership experience, and no qualifications for the job, Comey was appointed FBI director by Obama. The only qualification Comey had was that the Clintons and their cronies knew Comey was in bed with them, was compromised, and was willing to do their dirty work. Comey was appointed to the FBI right when Hillary was leaving the State Department, and was vulnerable to the FBI because she had been using a private server, mishandling classified information, selling access to favors/contracts from the State Department to Clinton Foundation donors (including Comey’s Lockheed Martin), and much more. Remember that this was about the time the Inspector General of the State Department found over 2 billion “missing” from the State Department finances during Hillary’s tenure. 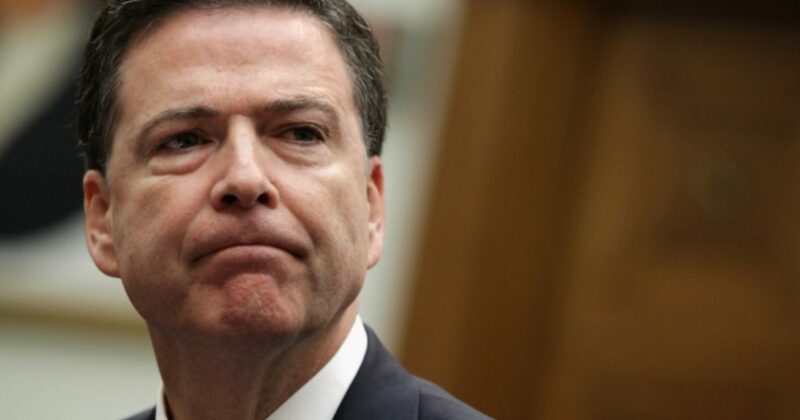 The obvious conclusion is that Comey was appointed to the FBI (along with other reliable Clinton-Obama cronies) to run interference for the Clintons and Obamas at the nation’s federal law enforcement agency (in conjunction with a corrupt Department of Justice). Comey was and is owned by the Clintons. He owed all of his power and wealth to being part of their machine and providing them with cover. There is much more to this story, and you can read it here. For now, understand that James Comey gets no protection from the crooked Obama administration. Unfortunately for him, we can actually see the mud at the bottom of the DC swamp water. Let’s see how this one play out.